When school is in session, driving safety tips are very important to follow in the school zone or wherever children may be standing or walking. School is in session driving safety tips begin before you pull your car out of the driveway. Make sure everyone is properly buckled up in their seatbelts. Children riding their bike to or from school should always wear bicycle helmets. A bicycle helmet can save a child's life or reduce injury tremendously. Watch for signs that indicate school is in session. Watch for crossing guards holding signs up indicating you need to stop and wait for all pedestrians to be out of the cross walk. 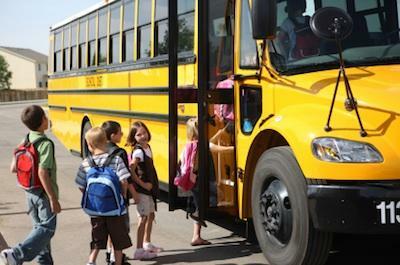 Watch for school buses that are loading or unloading children in front of houses or schools. When a bus pulls to the side of the road or even stops in the middle of the road, you must come to a complete stop. Do this when you see the stop sign flip outward on the driver's side of the bus. Sometimes children that leave the bus need to cross the street, the bus driver puts the sign out to warn you that a child may enter the street and you are not to pass the bus. One of the most important school is in session driving safety tips is….slow down. Never speed in or near a school. Slow down in residential areas and anywhere there are children walking to school. Most school zones have reduced speeds during school hours. If you get a ticket for going faster than the reduced speed, the fine will most likely be double or triple the normal rate. If you see other drivers that are speeding in a school zone, particularly teenage drivers who go to that school, write down the make and model of the car and license plate. Call the school and report the offense. Often, the police will be called in to deal with the offender and a student driver will lose driving privileges to the school. Many schools have an area where parents pull up to the curb to drop their child off or pick them up. It is important to use the designated drop off area and follow all the rules of the school for this area. If you can't use the drop off area, you should get out of your car and walk your child safely to the sidewalk in front of the school. Do not let your child dart through the parking lot by themselves. The drop off zone may have rules for how long you can sit in your car. Do not park and leave your car in the drop off zone, this will cause a traffic back up or force parents to drive around your car which can cause serious accidents.